A new photo for the upcoming feature adaptation of Divergent has made its way online, giving us a new look at stars Theo James and Shailene Woodley. Judging by their matching outfits and the stern expressions on their faces, it looks like we’re glimpsing a pretty serious moment. The Dauntless are known to be ready for action but lined up and facing front as they are, they look especially prepared in this photo. 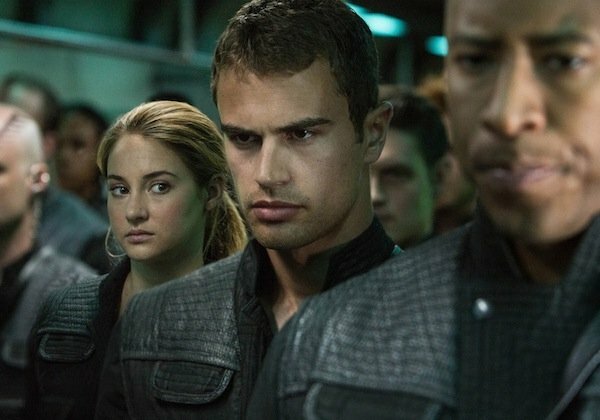 Tris is first introduced to Four as one of her new Faction trainers. The story is set in dystopian Chicago where society is broken down into five factions, which determine how each group lives their lives. At the start of the first book, Tris learns she’s Divergent, which means she’ll never properly fit into any one faction, and this is something she has to keep a secret as she chooses her faction and begins her training. The newest photo is presumably from some point later in the story, as Tris appears to be dressed the same as Four, and she’s standing among the rest of her faction. It also looks like she has her eye on Four and she looks doubtful or concerned. Possibly annoyed. It’s hard to say. She’s not smiling though, which is actually a noticeable contrast to the other image of Woodley we saw this week. She's all smiles in the upcoming film, new still from The Fault in Our Stars, in which she stars opposite Ansel Elgort. While that one doesn’t arrive until June, we’ll see Divergent on the big screen on March 21, 2014. Divergent is directed by Neil Burger, based off a screenplay by Evan Daugherty and Vanessa Taylor. We learned last month that his commitments to finishing up the first film will keep him from returning for Summit's adaptation of the second book, Insurgent.